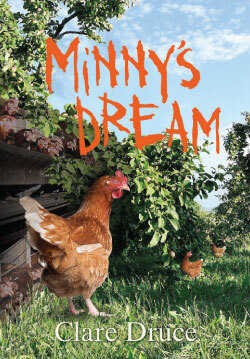 Minny’s Dream, by Chickens’ Lib founder Clare Druce, is a powerful and moving story about a young girl’s encounter with a “battery hen” named Minny, who begs her friend Paula to set her free. Should Paula help Minny and risk being arrested? Risk her parents’ wrath? Minny’s “dream” is the caged hen’s “ancestral memory” of who she really is and how she was meant to live, told in her own words. Order by check or money order for $10 from UPC, PO Box 150, Machipongo, VA 23405, or by credit card at www.upc-online.org/merchandise/humane_child.html. For my 2014 Review please see Chickens’ Lib: The Story of a Campaign.